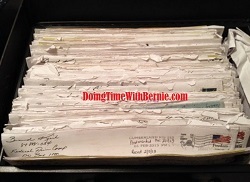 DoingTimeWithBernie.com: Is felon Bernard Kerik getting a probation violation pass that 'Soccer Mom Madam' Anna Gristina is denied? Is felon Bernard Kerik getting a probation violation pass that 'Soccer Mom Madam' Anna Gristina is denied? Felons on probation, both State and Federal probation, are generally not to be anywhere near guns...or does that depend on the quality of "supervision" and the exact felon being supervised? Here's another pose of felon Bernard Kerik up close and personal with a high-powered rifle, allegedly from a similar Newark New Jersey SWAT drill (Fall of 2014) posted openly on the Internet by one of Bernie's intimate **cough** NYC DOC Ladies' facebook account of Maritza Rosado. To the best of this blogger's knowledge, felon Bernard Kerik suffered no probation violation for these bold and public postings seemingly violating probation terms. It is also interesting to note the probation violating photo of Anna Gristina allegedly posing with a gun has not been published. 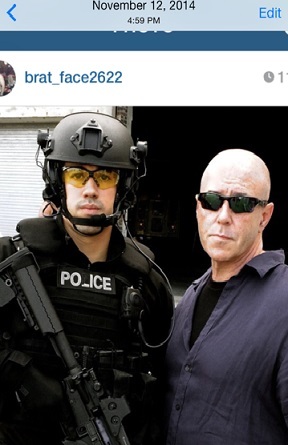 So it begs the question: Is felon Bernard Kerik (on Federal probation) getting a probation violation "pass" that 'Soccer Mom Madam' Anna Gristina (New York State probation) is denied? Is there a double-standard, a "pass", unequal treatment or is New York State Probation just better at "supervising" their "non-violent felons? 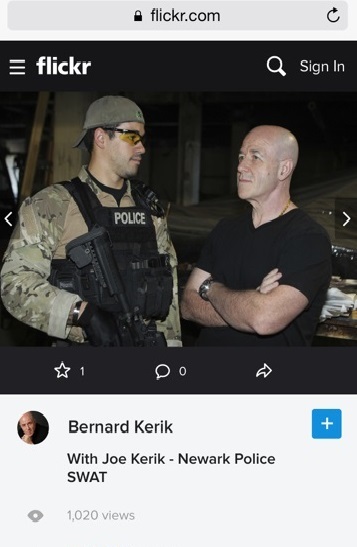 That may be a great question posed to the authorities allegedly "supervising" felon Bernie Kerik, the New York Southern District Federal Probation Authorities or the United States Probation Office is...wait for it...wait for it...Newark New Jersey!! No apparent conflict of interest or "pass" given here, right?